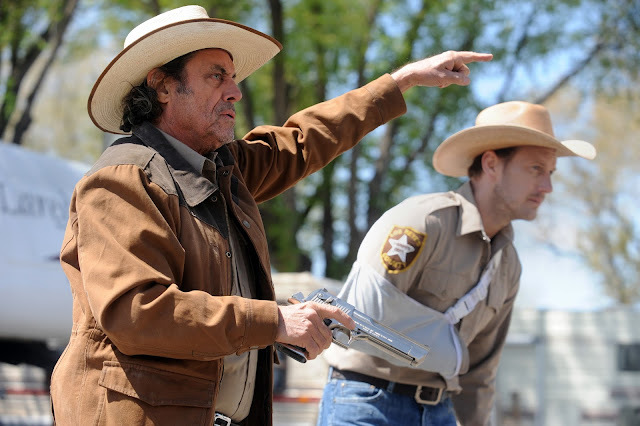 Patrick Wilson and Ian McShane take on the cartel in contemporary western meets Mexploitation flick, The Hollow Point. Director Gonzalo López-Gallego ensures this is a fun, action-packed trip even when navigating through Nils Lyew's overcomplicated narrative. After Sheriff Leland (McShane) is signed-off duty, Sheriff Wallace (Wilson) takes jurisdiction over a small US-Mexican border town - a hotspot for drug related crime. It's not long before the two Sheriffs are drawn into a violent battle with these cartels resulting in bloody consequences. You are not likely to find anything boldly original in The Hollow Point, but its delivered in such a bombastically entertaining and efficient way that it would be a challenge not to be drawn into the fun. The debut screenplay from writer Lyew's crafts some enjoyable characterisation - McShane is the badass former Sheriff with a mean streak - highlighted in one of the earlier scenes where he beats down a criminal before giving him a nasty send-off. He's a heavy-drinking dinosaur with an oversized gun and he's not afraid to use it. He's paired with Wilson as the almost as mean counterpart, with an equally short fuse. This pairing of grizzled tough guys leading us through the narrative is engaging and amuses, never taking itself too seriously. Lyew's narrative itself can be problematic, however, he has a tendency to needlessly complicate the story with confusing plotting in the final act. It's never quite clear what is going on, who is going where and who some of the supporting characters actually are. Fortunately López-Gallego's surprisingly brutal aesthetic keeps The Hollow Point loud and reminiscent of gritty eighties cop flicks and other contemporary thrillers - think Jim Mickle meets Michael Winner. It's refreshing to see little restraint from López-Gallego in terms of excitedly violent content with a hand sliced off by a machete in the first act. López-Gallego allows for plenty of moments of cool to give B-Movie fans a treat, as well as a savvy self-aware humour. A smoky shoot-out lead by McShane and some gung-ho older deputies delivers as much cool as it does humour, whilst a desperate supporting turn from Jim Belushi as a treacherous used car salesman adds to the fun. John Leguizamo commits to a brutal role as a bloodthirsty Mexican hitman fond of some unrestrained machete use, adding some venomous charisma to the fold. There is some nice cinematography from José David Montero capturing the small-town desert and Gonzalo López-Gallego's editing is punchy and crisp. Sometimes overcomplicated, The Hollow Point is nonetheless a brutally entertaining thriller that allows McShane and Wilson to deliver some badass cool.